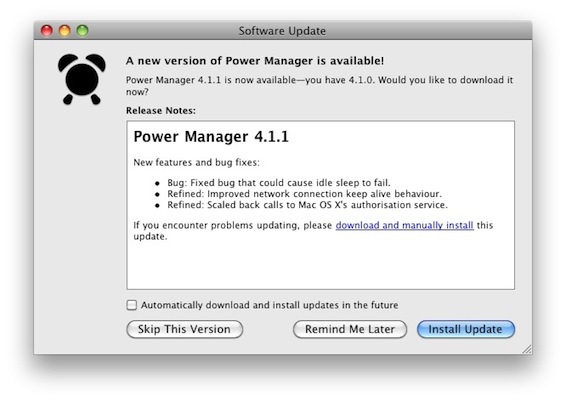 Power Manager 4.1.1 and Power Manager Professional 4.1.1 are now available. Power Manager is an energy saving solution for Mac OS X. Use Power Manager to reduce the running costs of your Macs, to save time, and to save energy. This update fixes a couple of bugs and provides optimisations for quiet network connections. We recommend all our customers upgrade to this version. Refined: Improved network connection keep alive behaviour. Refined: Scaled back calls to Mac OS X's authorisation service.